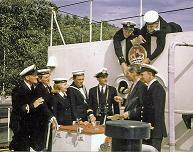 The Navy Lark is a much beloved comedy radio series that ran on the BBC from 1959 to 1977. It starred Leslie Phillips, Jon Pertwee, Judy Cornwell, Heather Chasen, Ronnie Barker, Dennis Price, Stephen Murray, Richard Caldicot, Michael Bates and Tenniel Evans. For information about the Navy Lark Appreciation Society, please email the Secretary Fred Vintner. This site is under construction, please check back again soon. A personal photograph taken by Evelyn Wells, Alastair Scott Johnston’s secretary, onboard HMS Chrysanthemum, moored in the Thames in 1962. This is a never-before published photo from a wonderful lady who supported the Society over many years, but sadly is now suffering from Alzheimer’s. © 2015 Navy Lark Appreciation Society. Webpage created using a template from TEMPLATED.